Activision and Treyarch have gone full sci-fi with Call of Duty: Black Ops 3, a game which, by the looks of it, bears no relation to the Cold War shootybangs of the original entry in this COD sub-series. The words 'Black Ops' just don't conjure images of rocket-launching, robot-battling cybermen, but maybe that's just me. Regardless, I'm appreciating the open spaces, special abilities, and adorable enemy robots shown in the above trailer, which could easily be for a new Crysis game. 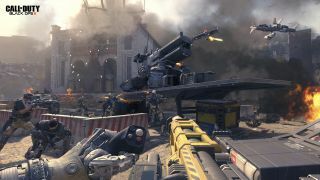 "Designed for four-player online co-op or solo play, players will encounter epic cinematic moments and open-area gameplay, allowing players to approach the game with a different strategy each time they play. And now your campaign character is completely customizable: from weapons and loadouts, to abilities and outfits, all with full progression systems and a personalized armory to show off accomplishments." This latest BLOPS is out on the 6th of November.